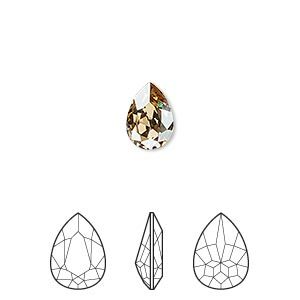 Embellishment, Swarovski® crystal rhinestone, Crystal Passions®, crystal golden shadow, foil back, 8x6mm faceted pear fancy stone (4320). Sold per pkg of 2. Crystal fancy stones are designed with precise machine-cut facet patterns that produce the signature Swarovski sparkle. Foil backing provides versatility, allowing the crystals to be incorporated into clays, molds and settings while retaining their color and vibrancy. Swarovski crystal rhinestones can be incorporated into an array of designs including wirework, glued into specifically calibrated 8x6mm faceted pear fancy stone Almost Instant Jewelry® settings or set in polymer clay, metal clay, Apoxie® Sculpt, ICE Resin® or Vitrium® Clay. 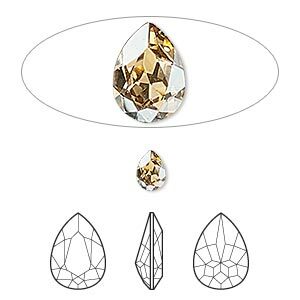 Embellishment, Swarovski® crystal rhinestone, crystal golden shadow, foil back, 8x6mm faceted pear fancy stone (4320). Sold per pkg of 18. 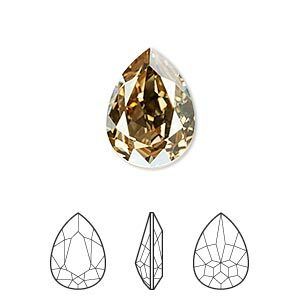 Embellishment, Swarovski® crystal rhinestone, crystal golden shadow, foil back, 8x6mm faceted pear fancy stone (4320). Sold per pkg of 180. 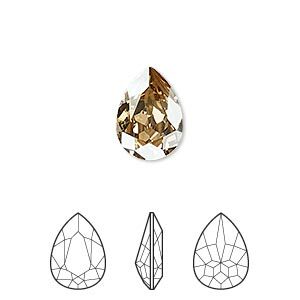 Embellishment, Swarovski® crystal rhinestone, crystal golden shadow, foil back, 8x6mm faceted pear fancy stone (4320). Sold per pkg of 4. Embellishment, Swarovski® crystal rhinestone, crystal golden shadow, foil back, 6x4mm faceted pear fancy stone (4320). Sold per pkg of 2.